This library uses the old API, and the soapi.info domain doesn't work anymore. There's still an archive on CodePlex. You may also want to check out it's big brother, Soapi.JS2, which offers a rich relational query based metaphore. Soapi.JS is not deprecated nor is it obsoleted by Soapi.JS2, each library has it's strengths and intended audience. // no unix timestamps here! todate: new Date("1 Jun 2010 12:00:00"), // or use a Date. up to you. Soapi.js is unobtrusive and has no external dependencies so it plays quite well with other libraries/frameworks. Soapi.js is packaged with Visual Studio intellisense -vsdoc files and full documentation in html format. Soapi.js includes advanced features including a configurable request caching buffer and throttled request queue. A few online demonstrations of Soapi.js usage can be found here. The demos are also contained in the zip download. You may use Soapi.js under the terms of either the MIT License or the GNU General Public License (GPL) Version 2. See http://soapi.info/code/js/license.aspx for more information. While soapi.info is not a CDN, the latest version of the script will always be available at the following locations. http://soapi.info/code/js/stable/scripts/Soapi.min.js.gz is also available but I have not configured soapi.info to properly serve gzipped content, so please leverage this option by self hosting on a server that is properly configured to serve gzipped scripts. While discountasp.net is typically trustworthy, I make any guarantee up uptime other than what they provide me. Soapi.js has been tested on all modern major browsers. Reports of platform related issues are welcome. In the answers to this Question are reference information, usage examples and demo applications developed with Soapi.js. Complete Route Listing - suprisingly simple mastery of the API via Soapi.js lies here. Date handling in Soapi.js - no more unix timestamps. All dates, all the time. How do I get a question? Any known app, great or small, written using Soapi.js will eventually be listed here. If you would like to help test the xbrowser compatability of Soapi.js, you may run a suite of tests in your browser or on your device. Thumbs up/Thumbs down reports in comments along with the platform and browser would be greatly appreciated. The test suite will always be here. 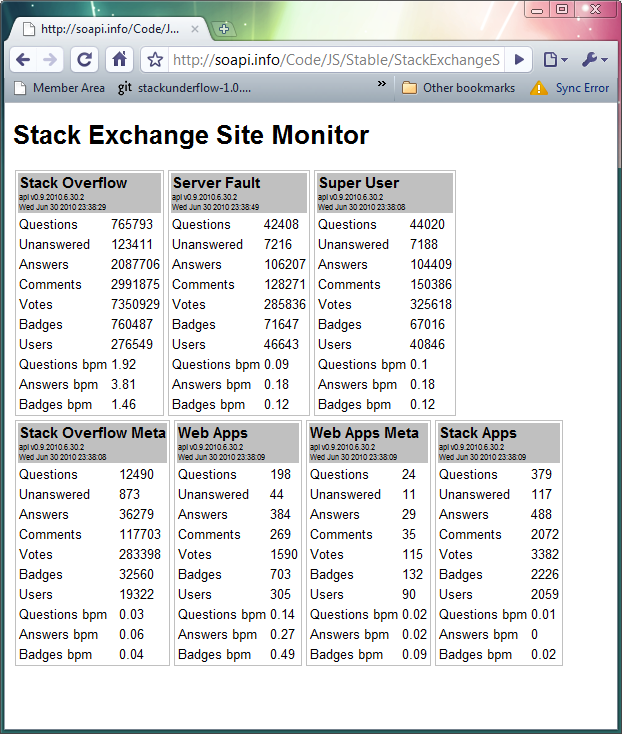 Demonstrates the use of Soapi.js to query stackauth.com to get an up-to-date list of Stack Exchange sites and then polling /stats for each one on a revolving timer. While the -vsdoc.js is quite large, it is never served. It is, if you are using Visual Studio, used to provide intellisense services, otherwise you may either delete it or keep it around as reference. The file that actually defines the domain types at runtime, soapi.js, is quite small, 9.5k packed, in that it only contains meta data that is used at 'compile' or more accurately parsing time to dynamically build the domain objects. There is a slight performance hit to be taken when using new Function() when compared to inline code but I have not seen that to be an issue, especially when you are dealing with network requests. It is my observation that an app using Soapi.js will be network bound as opposed to CPU bound. To use Soapi.JS, simply include soapi.js in your document. Soapi.JS is designed to be very simple to use. The only 'class' you will instantiate is RouteFactory. apiKey (Optional) - your application's registered apiKey. If you have no api key, API queries will be limited to 300 (or the latest limit) and requests will fail upon usage of that threshold. The JSONP mechanism provides no ability to access response headers and subsequently the x-rate-limit headers that provide usage metrics, so you will simply need to watch for timeouts and respond accordingly. RouteFactory's raison d'être is to hold a reference to the target site and the api key and build Route objects via factory methods. NOTE: you do not have to, although you may, use the new keyword when instantiating a RouteFactory. In the interest of application performance and to prevent inadvertent api 'abuse', Soapi.js includes an integrated request cache that stores the results of each unique request url for a default (and minimum) period of 60 seconds. The caching duration may be increased for individual routes as per your application's needs. After a successful response, subsequent requests to /sites within the cache duration will be returned from the in-memory cache. Upon expiration of the cache duration, the data for the particular route is purged from memory and the next request will be forwarded to the API. To provide transparent compliance with the throttle limite, Soapi.js includes an integrated throttled request queue. The queue is integrated into the library and is transparent, requiring no additional coding or consideration. The current default queue interval is 170ms. This means that, with the request queue and request cache, you may make requests with impunity and without concern for 503 errors or API abuse and all requests. Requests that are cached are not subject to queue delays. The request queue throttle interval can be adjusted from the current default of 170ms via the static Soapi.RequestQueue object e.g. Care must be taken to self-control bursts so as to comply with throttling rates, otherwise unexpected behavior can, well.. be expected. As a convenient side effect of implementing a request queue, throttled or otherwise, is the ability to provide feedback when your application is busy requesting data. This capability is implemented via global 'event' handlers and can easily facilitate UI blocking or manipulation e.g. ajax loading mask or other visual cues. * the queue length and show/hide mask as indicated. The majority of operation against the API involve paging operations. Most of the work and complexity of dealing with paged results have been encapsulated by the Route.GetPagedResponse() method. // returned to this, the success handler. // and return currently aggregated data to success handler. This file, while of special interest to users of Visual Studio, contains complete documentation of the API, including all enumerated constant values and route parameter specifications. As described in the Enumerated Constants post, soapi.js define enums that can help you write stronger code against the Soapi.JS library. In addition to the interesting 'enum' construct provided by soapi, the soapi-vsdoc.js file enhances the value of the enum types by adding Visual Studio Intellisense and Code Completion via the use of XML Documentation Comments. NOTE: The documentation is generated directly from the API, so it is assumed that the programmer will know that the 'semicolon-delimited string' description, in the context of Soapi.JS, describes, in the factory method call, a param array, and when setting parameters directly on the route, an array, which will be properly converted and encoded by getResponse. When becoming acquainted with a new library, it is sometimes helpful to have code completion assistance and intellisense documentation for the objects returned from API calls. By leveraging the vsdoc file and a special constructor function, we can build a 'casting' constructor that, if the object passed in is an instance of itself, simply return it, otherwise apply the object passed in to a new instance. This provides intellisense, code completion and method chaining via type inference. The fact that users is an array is demonstrated by the type inference provided by Visual Studio. Casting an element of the users array to Soapi.Domain.User results in the same effect. While this added functionality may seem trivial, in a scenario where one is dealing with a new/beta/constantly shifting API, this type of assistance can be a great productivity boost. Especially on objects that have many many members and nested objects. It is Visual Studio's type inference functionality, driven by the -vsdoc.js file, that enables complete intellisense code-completion throughout the compact, or 'fluent', example that is given at the head of the question to this answer. Next: Date Handling in Soapi.js - no more greasy unix timestamps. A: How do I get a question? The RouteFactory's factory methods are consistently and intuitively named by convention to make banging out code without intellisense code completion as painless as possible. NOTE: the stackauth methods/routes are available on every RouteFactory instance and are not tied to a particular target site. In fact, you may simply instantiate a RouteFactory with an empty string for target. This is useful in that you need to fetch /sites (Sites) in order to get an authoritive list of api_endpoint to use as target. The one exception that I have made is to abstract the array property of all 'returns' types to items. This enables more powerful application patterns. With an understanding of this simple code snippet, you can now easily and freely explore the Stack Overflow API with Soapi.js. * Global success handler. Replace (override) this method. This event is raised before the instance success function. There are a few reasons for the duplicated effort. There is currently no public means of generating vs doc xml from POJO code. I have an abandoned and partially implemented project but have not taken the time to revive it for reasons that will become clear. The JsDoc format is far more expressive than is the Xml Doc format and better than mix those concerns, I find it a much cleaner, albeit labor intensive, approach to use JsDoc Toolkit for generating hard copy docs. There are a few features that JsDoc Toolkit does not support, so there are some post processing that needs to be done. run a search and delete of JsDoc comments to output a smaller vsdoc file. All of this could be built into a custom MSBuild task, but for now it is being performed by the included console application, Soapi.JS.Deploy, that is run on successful builds. As of RC2, Soapi.js is Dates in, Dates out. No more dealing with unix timestamps. todate, fromdate may also be specified using string, e.g. "1 jun 2010 00:00:00". min and max are special 'variant' parameters and when dates are appropriate you must explicitly set a Date object. alert("min/max\r\nThis date should be between Tue, 1 Jun 2010 00:00:00 and Tue, 1 Jun 2010 01:00:00 \r\n\r\n"
alert("fromdate/todate\r\nThis date should be between Tue, 1 Jun 2010 00:00:00 and Tue, 1 Jun 2010 01:00:00 \r\n\r\n"
Many routes accept a 'vectorized list of identifiers'. This allows you to retrieve data for multiple items and helps maximize efficiency and performance. The problem is that the 'vectorized list' is part of the url path, which much remain below a certain length (around 240) to avoid 400 (Bad Request) errors. the VectorizedIdList allows you to add an arbitrary number of values and will emit batches that will result in a url that is withing length tolerances. Does Soapi.JS slow down requests to prevent 503 errors when necessary? If not, would you add that code if I wrote it? Soapi.js defines Route 'classes' for each and every route, or URL, in the Stack Overflow API. A Route is primarily a 'class' off of which to hang the URL path and define the parameters for the URL. Specifying required 'id' parameters in the factory method call and the application of parameters via explicitly defined parameter objects or JSON literals will be covered later in this post. A Route, once constructed via the factory methods on RouteFactory, may be re-used as often as desired. timeout (optional) - number - The default timeout value is 10,000, or 10 seconds. If this is not acceptable, simply provide a timeout value in ms. Routes that require an id, typically a semi-colon delimited list of identifiers, the factory method will accept id values as a param array, e.g. (id1,id2,id3,...) and construct the 'vectorized, semi-colon delimited' string for you. The other parameters of the route may be supplied as an object literal in the factory method, as shown, explicitly set on the Route object itself or applied via the Route.applyParameters function with an object literal. 'semicolon-delimited' parameters, which can be set in the factory method call, can be set as a string, ('1;2;3'), a param array, (1,2,3) or an array, ([1,2,3]), and are properly encoded by getResponse. Setting parameters directly on the Route object will, I think, be of more interest to Visual Studio users who may take advantage of the intellisense and code completion provided by soapi.generated-vsdoc.js. This topic will be covered in detail in the Intellisense Support post. The advantages of using enums include the elimination of magic strings scattered about your codebase and the ability to update all references to an enum value in one location. Soapi.js defines 'enums' for all of the 'choice' parameters and return types in the API. Using enums may seem like more work in that they are more verbose than using string constant but in reality they make your code more robust and much easier to read and maintain. Users of Visual Studio will get extra benefit from the use of the defined enum types as they have the luxury of intellisense code completion, which will be covered in detail in the Intellisense Support post.